Get ready for a most unique evening of entertainment, Saturday, March 9, at 7:30 pm! The two-person comedy drama/music performance piece Is There Life After Lubbock? 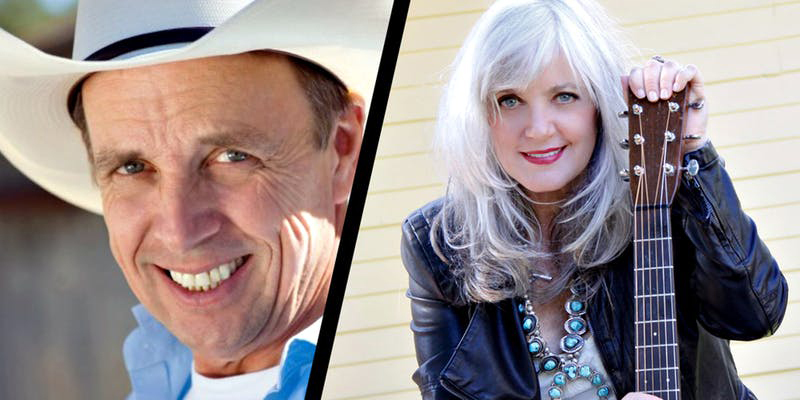 features two of the South Plains’ favorite performers doing what they do best: entertaining audiences with their special combination of with, humor and storytelling. A unique combination of theater and song - this event is a special evening to be treasured! For several years, he has toured in Larry Shue’s The Foreigner, The Fantasticks, and directed the musical Bad Girls Upset By The Truth. Jaston received the Texas Governor’s Award for Outstanding Contribution to the Arts by a Native Texan and has performed at the White House on three occasions. Jaston’s autobiographical play, I’m Not Lying, was the first of his six solo shows, all receiving critical acclaim in performances across the country. The others solo shows are: Cowboy Noises, Camping With Gasoline, Blame it on Valentine, Texas, Maid Marian in a Stolen Car and Clear To Partly Crazy. Jaston enjoys sharing the stage with friend Kimmie Rhodes in their performance piece, “Is There Life After Lubbock?” Jaston is the recipient of the 2013 Texas Medal of the Arts and has been inducted into the West Texas Walk of Fame. In her three-decade-plus career, Austin-based singer-songwriter Kimmie Rhodes has released 16 solo albums, written and produced three musical plays, published a novella/cookbook and written many multi-platinum songs, recorded by such stellar artists as Willie Nelson, Wynonna Judd, Trisha Yearwood, Amy Grant, CeCe Winans, Joe Ely, Waylon Jennings, Peter Frampton, Mark Knopfler, Emmylou Harris and others. A native Texan, she was raised in Lubbock, where she cultivated the spirited mix of talent and determination that still fuels her success. Rhodes recently released her memoir, "Radio Dreams: The Story of the Outlaw DJ and the Cosmic Cowgirl.” She served as liaison, consultant and donor of archives and artifacts for a major Country Music Hall of Fame Museum exhibit, “Outlaws and Armadillos; Country’s Roaring 70’s,” which opened spring of 2018. Rhodes also received a special recognition award from Mayor Dan Pope and The Lubbock City Council in May of 2018 for her achievements as a singer-songwriter, playwright and author. In her role as an honorary ambassador for The Buddy Holly Educational Foundation, Rhodes visits Glastonbury, England annually to attend Squeeze co-founder Chris Difford’s songwriting retreat at Pennard House, where established singer-songwriters share knowledge and co-write with aspiring young talents. Foundation co-founders and Holly’s widow, Maria Elena Holly, recently celebrated Rhodes’ efforts by presenting her with a custom-made guitar crafted by famed luthier Alistair Atkin. A replica of Buddy Holly’s 1943 J-45, the guitar is encased in hand-tooled leather featuring the words “Lonesome Tears,” the Holly song for which it’s named. Fellow ambassadors with whom Rhodes shares this special honor, each presented with a uniquely titled guitar, include Paul McCartney, Keith Richards, Pete Townshend, Dolly Parton Bob Dylan and Joe Ely.